March 11, 2019 (Tulsa, Okla.) — Philbrook Museum of Art has always been a great place for reflection and contemplation. 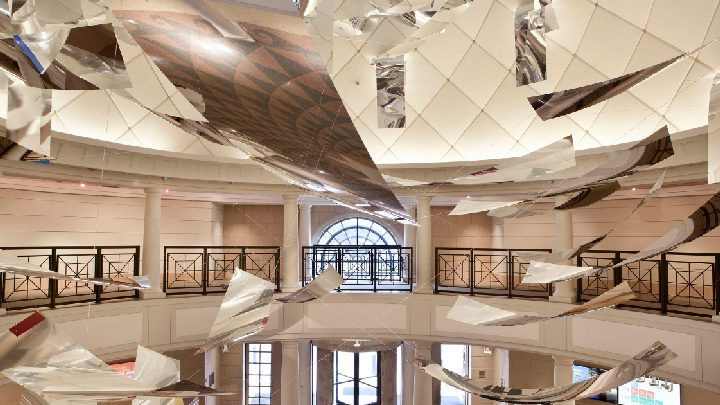 That’s especially true now thanks to a new site-specific installation in the Zink Rotunda by acclaimed artist Sharon Louden, on view through the end of 2019. Using highly reflective raw aluminum sheets along with colored aluminum strips, monofilament, steel screws, and glue, Louden and a dedicated group of artist installers created the work live in public view over the course of ten days. This installation marks Louden’s first art installation in Oklahoma. Her work is held in major public and private collections including the Whitney Museum of American Art, National Gallery of Art, Neuberger Museum of Art, Arkansas Arts Center, Yale University Art Gallery, Weatherspoon Art Museum, and the Museum of Fine Arts, Houston. To celebrate the completion of the work and the public debut, Philbrook hosted an event called “Silver Social” in a nod to the installation materials. Philbrook Members and guests partied under the shimmering piece in an exclusive first-look at the creation. Sharon will return to Tulsa several times in 2019 for various programs related to her work. “I feel tremendous gratitude and am honored to be a guest at Philbrook and in Tulsa. As a guest I like to listen, to absorb information and experiences by others. I’m just grateful for the opportunity to be a part of this amazing community for a short time through my work. I hope people will have a feeling of inclusion from my installation,” says artist Sharon Louden. For extended bio visit sharonlouden.com/bio.